Landscape photography is rarely described as hazardous but that does’t mean that it’s without risk. Just about every trip to Yosemite has me landing on my backside at least once. While falling is usually painful I’m certain that I offer great comedic value to those around me. That’s what I do; I’m a giver. This shot was taken on the same morning as my last 2 posts. Yosemite, beautiful in any season, is especially magical under a fresh blanket of snow. Under an untouched covering of white, the whole park instantly becomes more photogenic. Getting to this scene was tricky. Across the road from Tunnel View is a large granite shield on the side of Turtleback Dome. A trail snakes up the side before becoming a series of switchbacks leading up to “New” Inspiration point. The trail skirts this granite slab for one very good reason; it’s quite slick. Knowing that something is slippery and deciding to go anyway probably wasn’t the best choice. I wanted to get a shot of the meltwater running down the granite, beneath the fresh snow. I loved the contrast between the two and the visual motion that they imparted. Snowshoes still in the car, I headed up the side of the hill the same way that I almost always travel in Yosemite. My camera was on the tripod, the tripod over my shoulder and some extra lenses and gear were in my photo vest. I found that if I stayed on the thick snow I had pretty good traction. Step on a wet area or one with less snow? Not so much. Arriving at my shooting location unscathed. I started moving around to find my composition. It was at that moment that I figured out that bit about less snow being slick. I stepped down, not really paying attention, and had both feet slip out from beneath me. In just a blink of an eye I had to do what any decent photographer would do; protect the gear. Rather than do the intelligent thing and try to break my own fall I thrust my tripod up into the air to keep the camera from hitting first. The camera was fine, my elbow was throbbing but there was still the matter of the picture. I picked myself up, dusted off my camera, told my wife to stop laughing and proceeded to make this image. 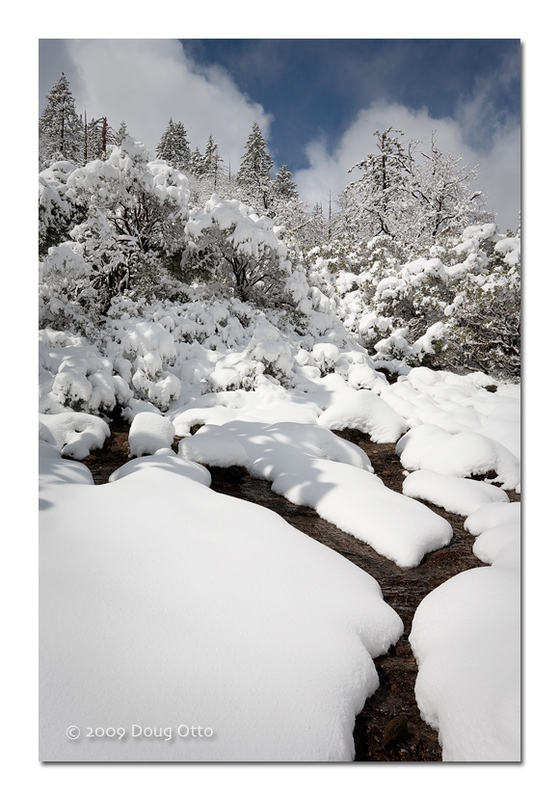 This entry was posted in Photography and tagged doug otto, Photography, slippery, snow, yosemite, yosemite national park. Bookmark the permalink.